Isosceles is Western Canada’s largest vendor of Allworx phone systems and an Allworx Apex Partner at the Silver level. 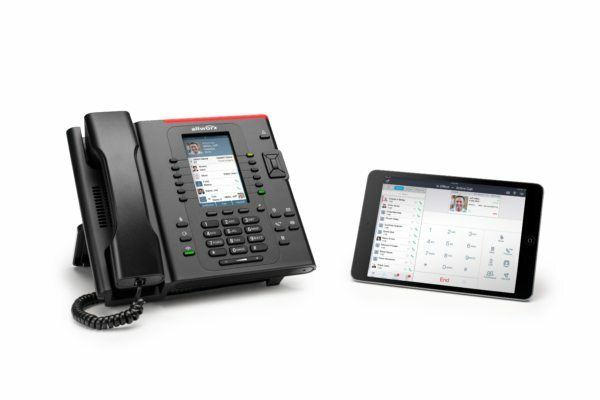 An Allworx system perfectly merges older PBX phone systems, with modern VOIP technology and features, like apps in cell phones, remote phones and computer integration. Supporting older and newer telephone line services, Allworx allows you the freedom to choose the best rates for your line services, from any vendor, and avoid being locked to a certain platform or vendor. Allworx is a premise-based phone system. After the initial hardware costs, scalability and connection costs can be significantly lower than a cloud based system so is best suited to a network of five or more phones. The cost of a new system or hardware can often be paid for by savings made through a services audit and application of new rates or technologies. Isosceles provides free telecommunications audits for businesses. A Cloud PBX includes all the features of traditional PBX, plus all the modern VOIP features, like apps in cell phones and remote phones. For a workplace with 5 or less phones, a Cloud PBX system can typically provide the most cost-effective solution. Customization of branding on phones and unlimited phone lines, including long distance across Canada and USA are added benefits of a Cloud PBX system for your business. Cloud PBX phones are best utilized in todays market for 5 sets or less deployments. Beyond 5 sets it is often wise to explore an on premise solution as an option as well. Isosceles provides expert service and support for many older Analog telephone systems and line technology. Sometimes the best solution is still the analog one. There may be several reasons why your business is using an analog PBX system, or line services: it might be the only infrastructure in place, or it could be too cost prohibitive to upgrade. Whilst support may be harder to find these days, we have your back with trained staff available to fully support your older telecommunication needs.